The size of your Himalayan Crystal Salt Lamp is important because of the quantity of negative ions emitted from the lamp is directly related to its weight. Therefore, it is advisable to choose a lamp of the correct size for your room. Please note: all heights are approximate. » What is Himalayan Crystal Salt? "The word salt comes from the Latin term sal, which again comes from the word sol. Sol is synonymous with the word 'sole', which is water and salt solution and also the Latin word for sun. Mythologically, and from its definition, sole means 'liquid sunlight', the liquid materialisation of the Sun's energy, liquid light energy, bound into a geometric structure, capable of creating and sustaining life. This literally explains where life on earth came from: the sole of the primal oceans." - Taken from the book Water & Salt - The Essence of Life by Dr Barbera Hendel MD and Peter Ferreira. 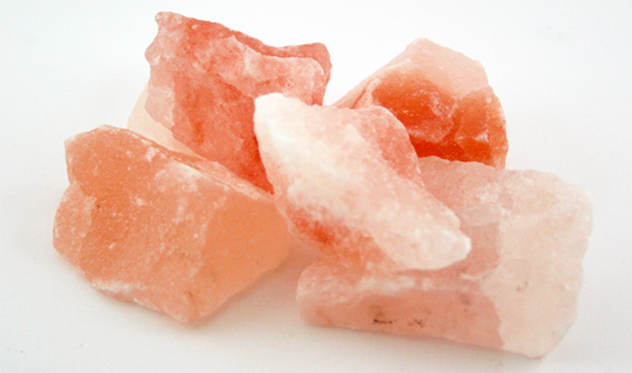 Original Himalayan Crystal Salt is found at the base of the Himalayan mountains and mined in Pakistan. These crystal mineral salts have been formed over millions of years from the evaporation of the primal seas and gradual crystalisation of their salts. These ancient salts contain all 84 elements found within the human body and are totally free from environmental pollutants as the deposits have been locked in the earth for over 250 million years. The salt is hand mined from its source with wooden tools and is then hand washed and subjected to no unatural processes whatsoever before export. Time and pressure is responsible for creating Himalayan Crystal Salts. The higher the pressure, the superior the order within the crystalline structure. As Himalayan Crystal Salts have been formed over a huge period of time, and under a huge amount of pressure, their crystalline structure is superior to that of most other salts. Whatever your diet, even if you don't add salt to your food at the table, the products that fill our supermarkets and fast food outlets are more often than not packed with high levels of mineral-poor and quite frankly poisonous refined salt with little or no nutritional value. Shockingly over 90% of the money spent on food in our society is on processed food products, meaning that, often unbeknown to us, we consume far more refined salt than the safe Recommended Daily Allowance (RDA). This is over twice what it should be and can be largely attributed to our huge consumption of processed foods that many of us accept as a staple in our diets. Consequently, this has led to an aura of fear associated with salt and the costly effects of its over-consumption, along with the generally universal thought that salt is a negative product and that we should avoid it or minimise its consumption at all costs. However, the human body needs salt. Without salt, essential body procesess could never occur and we simply would not function. Our blood actually contains 0.9% salt which maintains delicate balances throughout the body. Like most food products within our society, there is generally a huge variety, varying from the high end top quality products through to cheap and nasty ones that have little value to the function of our bodies. Salt is no different. In the same way that there are some fats that are good for you (eg Omega 3, 6 and 9 essential fats) and others that are bad (like hydrogenated fats), there is good salt and bad salt. A good salt, like Himalayan crystal salt, can provide benefits when consumed as part of a natural and healthy, balanced diet. Our Himalayan Crystal Salt is a freely available, natural, unrefined, unadulterated and mineral rich salt product and is of the highest quality. It has many positive applications to health and life, and is a gift from ancient earth. sir i have heard that taking ACV long term may decrease pottasuim levels and could result in weak bones is it true? Hello Bobby & Staff - Lately, I 've grown concerned about Himalayan Pink Salt. I've heard it is unhealthy and contains high amounts of fluoride, is this true? I am a long standing client of Bobby's Health Shop and I need to know Bobby's opinion. Of late, I've had some gall bladder problems, never had that before, and I am wondering if it is from the Pink Himalayan Salts? I also use the alkaline water jug with refill from you - do those rocks ever cause problems? We have RO water and then re-energise the water with your alkaline jug - it's been working wonders for us for quite awhile. Can you pass along to me your honest opinion on the Pink Himalayan salts? Or, perhaps recommend something for the gall bladder?